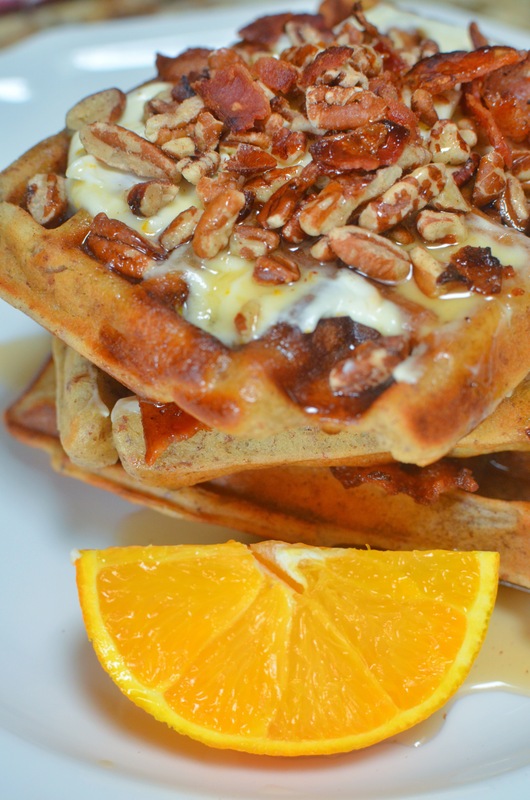 There is nothing like delicious crunchy, yet soft waffles with the delicious texture of pecans. Pecans are my favorite, ever! But if they’re not yours, or you don’t have some right now, use another. I highly recommend using some type of delicious nut in this recipe though, it is just perfect. 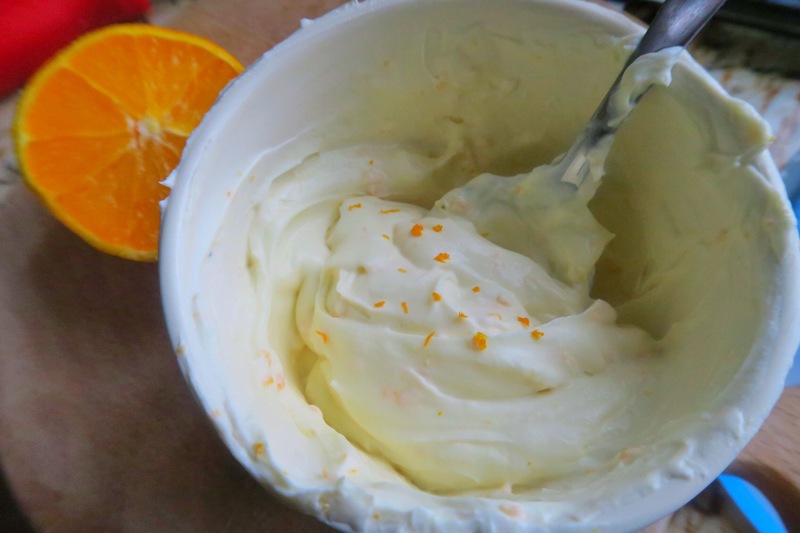 The orange cream is made with mascarpone, and taste just like an orange creamsickle. The flavors really marry well together, especially if you dare add bacon (inside or on top!). This is really a delicious treat, and although not the ‘healthiest’ recipe on this blog, it is still a ‘skinnified’ and nutritious version. 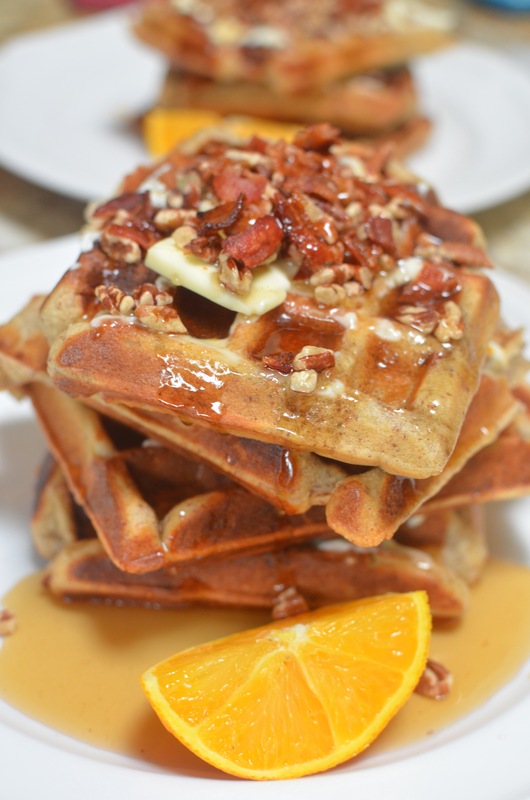 This does make the perfect weekend brunch, so without further a do…this is what you do! 2 tablespoons unsalted butter, melted and cooled, plus more for brushing and topping. If you’re feeling daring and want a pop of flavor, substitute this for bacon fat. If you’re watching your fat intake, it’s complerely fine to leave this out, however if will add to the crunch of the waffle. Preheat the oven to 350 degrees F. Spread the pecans on a baking sheet; bake until toasted, 5 to 7 minutes. Let cool, then chop. Reduce the oven temperature to 200 degrees F.
Whisk the flour(s), meals, sugar, salt, baking powder and baking soda in a large bowl. Whisk the egg, milk, Greek yogurt and vanilla in a separate bowl until combined. Stir the egg mixture, melted butter, and coconut oil into the dry ingredients until just combined. Fold in pecans. It’s ok for batter to be lumpy. Preheat a waffle iron and brush with melted butter (or bacon fat). 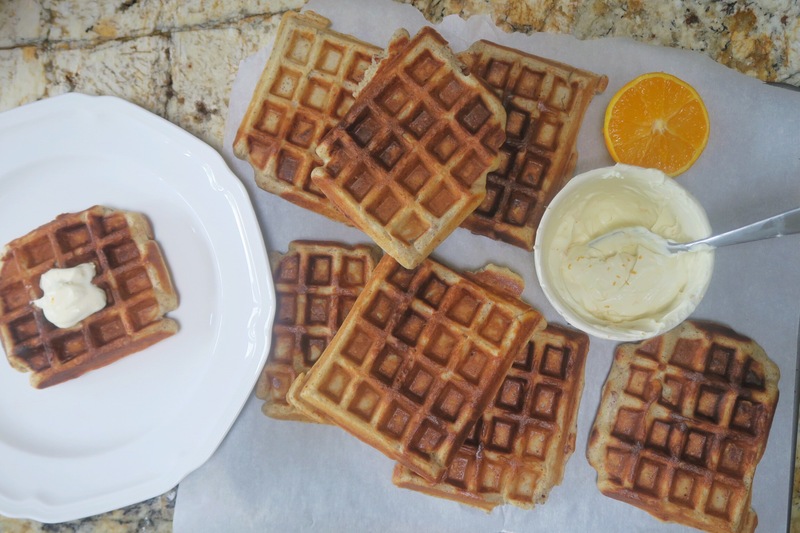 While waffles are cooking, mix together ingredients for orange cream until nicely whipped. Cook until golden brown, then transfer the waffle to a baking sheet and keep warm in the oven. Repeat with the remaining batter. 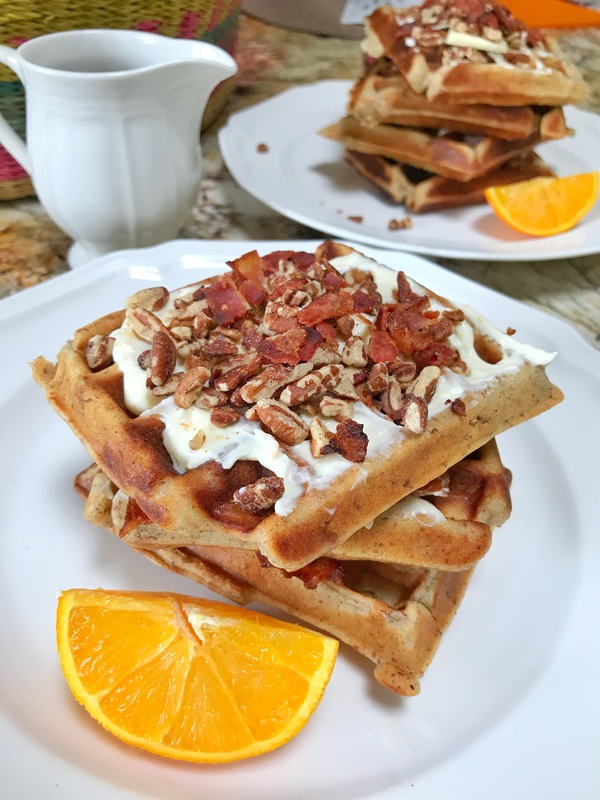 Top the waffles with orange cream or butter, more pecans and even crumbled crispy bacon if you’re feeling it! Drizzle warm maple syrup, of course. This is fantastic! I hope you enjoy it! SNAPCHAT: AnaSandee – Follow for all recipes in real time before they make it to the blog! They typically end up on my YouTube channel as well! Videos stay up for 24 hours. 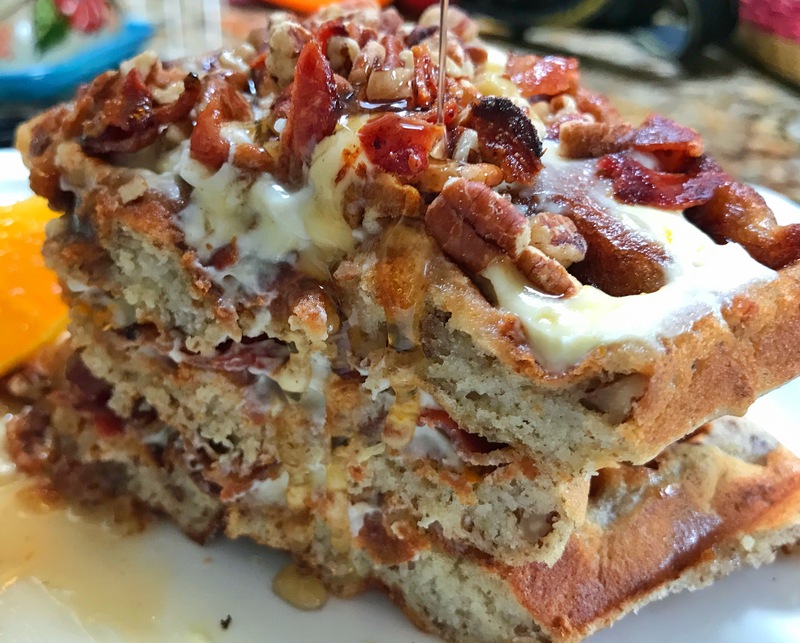 This entry was posted in Brunch It On Sundays, Brunch it on Sundays, Sweet Stuff, Uncategorized, Waffles and tagged bacon pecan waffles, bacon waffles, orange cream, orange mascarpone, pecan waffles. So, I’ve always loved waffles more than pancakes and I recently bought a waffle maker. I can’t wait to try this recipe out!! !